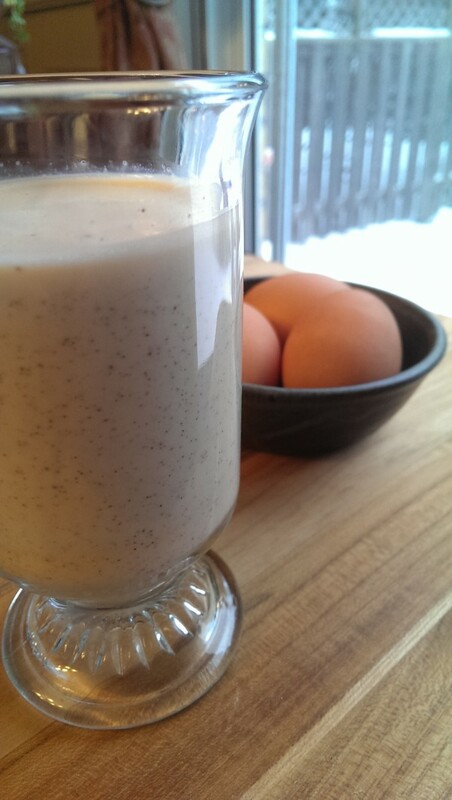 Once upon a time last Christmas season, I was enamored with the idea of making eggnog all the things. Eggnog cookies, eggnog bread, eggnog treats and drinks and toddies and etc. etc. etc. And then I made a terrible mistake. While I was at the store, I looked at the ingredients on a box of eggnog. After reading through and realizing that much of the commercially boxed stuff not only doesn’t have any eggs in it, it’s usually with 1% of dairy or less (what the actual fudge? ), I vomited in my mouth just a little bit and decided that licking the bottom of the inside of a fridge at the local 7-11 would probably be tastier. Fast forward approximately 1 hour and some furious Googling, I discover that the reason nobody drinks eggnog anymore is a deathly paranoia about 1 in 20,000 odds over salmonella, which is something that apparently nobody gave a rat’s rear end about when I was a kid, cause we’d eat raw chocolate chip cookie dough by the entire double batch. I’m relatively sure that the odds of having a salmonella contaminated egg have gone down over the last 30 years instead of up. For all I know, it was 1:100 in the 80s. Or maybe our parents lived by the mottos “whatever doesn’t kill you makes you stronger.” Who knows. We were a wilder breed back then, full of Aquanet and Milli Vanilli. And we liked it that way. So we’ve got a whole generation of people who have never watched Rocky and think drinking raw eggs is tantamount to playing chicken with a train. FORTUNATELY this is an easy fix, especially if you’ve ever seen the way the French do scrambled eggs. STAND BACK: I’m going to try science! *I can take no personal responsibility for ensuring you do this correctly. Just sayin’. But really…. 1 in 20,000, even if you screw it up. So by now you are probably wondering, “Why the Holy Christmas would I want to make eggnog? I hate eggnog.” And this is where words begin to fail. Because unless you have actually tried real eggnog, you have no ability to comprehend real eggnog. It’s like trying to imagine infinity. Your brain kersplodes before you are able to conceptualize it. And so until you make it, you can’t say you hate eggnog. Because you know nothing. You hate the boxed stuff for being the poser it is, and to be perfectly honest, I can’t blame you. I hate artificially-flavoured eggnog-spiced carrageenan and tapioca starch too. Even when they throw in locust bean gum for texture. Make the real stuff once and take it to your Christmas party. I promise you, while it takes a little bit, most of the prep is chill time in the fridge. Some things are worth the wait, because the more it gets to meld, the more your epic deliciousness index approaches 9000. Then, when you bring it out and serve it to the people, prepare to be worshipped like a god. There is literally nothing that you’ll be able to buy that tastes like this. Nothing. There ain’t no thing like the real thing, baby, and this is as real as Christmas gets. And now you know how to make eggnog, real eggnog. Like a boss. Real eggnog. You know, eggnog that has real eggs and milk in it? The eggs are cooked, so you have no excuses to avoid buying the boxed crap. In a heavy-bottomed soup pot, combine the milk, ground cloves, split vanilla bean, and cinnamon. Heat very slowly over the lowest heat, whisking frequently, until nearly simmering. Remove from heat. Separate the yolks from the eggs, and discard whites or refrigerate promptly. With a whisk, beat the yolks well for a minute. Add the sugar and whisk thoroughly, until the yolks become a lighter shade and almost fluffy. Temper the egg yolks by adding ladles of the hot (but not boiling) milk mixture one to two at a time to the eggs, whisking thoroughly before adding more. Once all the milk has been added to the eggs, return the egg and milk mixture to the large pot over medium heat. Whisk constantly for approximately five minutes, until the eggs begin to thicken. The eggs must not be allowed to reach a near-boiling temperature. Remove from heat once thickening occurs. Pour through a fine sieve into a serving bowl to remove any small curdles that may have formed. Add in cream, vanilla, and nutmeg. Refrigerate 6 hours to overnight before serving. For alcoholic eggnog, START with approximately 1-1 1/4 cups light rum (the clear kind) or bourbon, or allow guests to add their own so that some is safe for the kids. Double the rum if you like to breathe fire and achieve the maximum inebriation to drink ratio while enjoying your eggnog (some do; we won't judge, but DO take a taxi home). 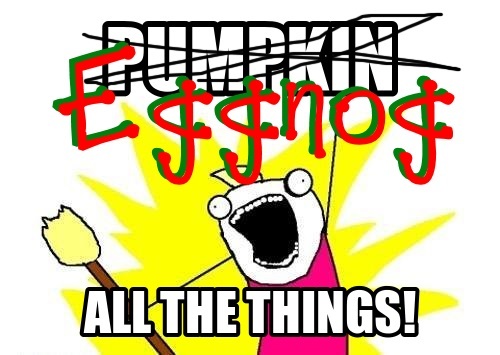 Top two images lovingly attributed to Hyperbole and a Half and artist Allie Brosh, since I also have lost my enthusiasm for making eggnog all the things. Making things like candy, gravy or eggnog terrify me and I’ve ruined at least one copper pot. I do love the idea of real anything, so I’m going to attempt. Would it help if I drink a little rum before I start? The trickiest part of making eggnog is to keep the milk from scorching when heating it up, and eggs from getting too hot and curdling, so keep the heat reasonable (especially if you’re using an electric burner) and err on the side of low and slow. So once you’ve got your milk good and steamy (but not boiling), set it aside off the heat to begin to cool down a little while you separate the eggs and whisk them with the sugar, and then temper the eggs by combining milk into the eggs gradually. Absolutely Sara! I’ve let the author know and we’ll correct ASAP!